The Acceleration Years in the Development of Rejuvenation Therapies – Fight Aging! The upward curve of technological progress is steepening, and this is particularly the case for the development of medical biotechnologies capable of meaningfully addressing the causes of aging. These are the acceleration years, in which the first rejuvenation therapies exist in prototype form, commercial development begins in earnest, and funding starts to pour into the field. That in turn drives funding into many neighboring areas of fundamental research that have previously struggled, bringing further rejuvenation therapies closer to viability. If you look at the outset of past fields of human scientific endeavor, most are stories of decades, sometimes generations, of painfully slow, unsupported attempts to make progress. Then all of of a sudden, in the course of a decade, the tipping point is reached and an entire industry blossoms into being. We are just about there for rejuvenation biotechnology; it is the end of the lengthy beginning, and the start of a great and energetic new phase of development. It is customary, in techno-visionary circles, to base one's expectations of the future on the principle of exponentially accelerating change. The often uncannily accurate timeframe predictions of Ray Kurzweil have engendered a culture of thinking and talking in exponential terms, even when it comes to the names of conferences. 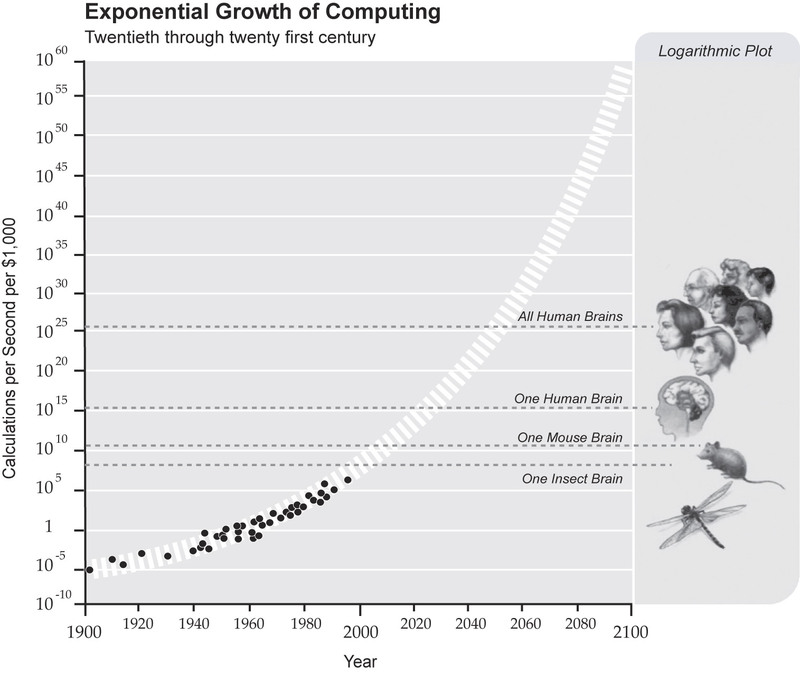 Like any one-word meme, this does not tell the whole story: some aspects of technological progress pretty clearly don't proceed exponentially, and indeed some (which, mercifully, include the rate of progress necessary to maintain longevity escape velocity once we reach it) don't need to be exponential in order to achieve needed goals. But today I want to highlight the opposite phenomenon: phases during a technology's development when progress is genuinely superexponential, as with the sudden acceleration in 2007 or so in the amount of DNA that could be sequenced for a given price. Inevitably, my sense that rejuvenation biotechnology has had a bona fide superexponential year is to a large extent subjective. However, my location at the eye of this storm gives me some basis for feeling that I'm probably basing it on good information. What is that information? The single biggest item is the truly breathtaking rate of proliferation of private-sector involvement in this space. That proliferation has been manifest on both sides of the fence - in the number of startups seeking investment, and equally in the number of investors seeking opportunities to get involved. A comparison with the situation just twelve months ago can be made in many ways, but for me the most straightforward is the task of organizing a one-day investor-facing event in early January in San Francisco on behalf of my friends at Juvenescence. In 2018, the task of identifying a dozen companies to showcase was easy for me - that was pretty much the total number of startups I knew of in the rejuvenation space that were in a fundraising mode, and I was pretty sure that not many others existed below my radar. But I'm engaged right now in organizing the same thing for January 2019, and the situation could not be more different. Even when restricting my attention to companies located in this part of the world, I am swamped with high-quality options; and literally not a week goes by any more when I don't become aware of another one. The takeoff has been as spectacular as for the dotcom boom. What of the other side of the fence, the investors? There the story is just as bright. A year ago, I could count the investors who were overtly focusing much, and in some cases most, of their attention on the rejuvenation space on the fingers of two hands. Now, it is no exaggeration to say that I have lost count: every single conference I speak at (and that's more than one a week on average) I am approached by an investor who is eager to learn more about how to get involved. The acceleration is staggering. The dotcom boom is again the natural comparison, and again I think the trajectory is similar. Well I am a bit more sceptical on the rate of the progress. Kurzweil is right on the nature of the technologicalv tends but he is blatantly over optimistic. One has to discount his estimates by an rate factor of 3 to 4. There will be no advanced nano technology by 2028, probably no passing the Turing tests. That all will happen much later. Like a few decades later. However, even with the first crude therapies like senolitics, and rigorously maintaining a healthy lifestyle most of us still can reach LEV. Brilliant to get a little insight into why Aubrey has been so much more positive over the last year. I think you are overly hard on Kurweil, Cuberat - for example 2028 is a very long way away in technological terms and you may yet be proven wrong even if it appears no progress has been made in the space. I'm sincerely not being cynical when I say that a motivation for this exponential expansion is that I read somewhere that there is more than 20 Trillion dollars of wealth that will be transferred in baby boomer estates in the next 20 years is the actuarial tables are not radically altered. The tables are in the process of being radically altered ;) . I love this blog! Reading the first paragraph immediately lifted me out of the Monday funk. That was the first question that came to my mind too. However, in the article itself they deliberately avoid the whole organ thing and are cautiously optimistic about growing organoids. Probably there are more hurdles before being able to grow larger organs. Kurzweil is one of the few futurists that actually predict concrete things and understand the trend. However, he is too optimistic on the rate of change. In the big scheme of things, being off a coupleof decades on your predictions is nothing but he insist on being right or essentially right on the exact dates. That's borderline foolish, especially when we are witnessing the death of the Moore's law. He insists that the progress is accelerating and doubling almost every 6 months. I would say that the doubling times should be 2 to 4 years, and they don't apply to every type of semiconductor technology as they did in the 90s and early 2000s. If you apply the doubling rate of 2 and then 4 years to his predictions timeline then it will make more sense. And some of the progress slower still, but when it happens it is much more sudden if compared to the general smooth trendline. Of course, just because you have more powerful processors it doesn't mean you will make a meaningful progress on rejuvenation. And the inverse is true too. Some of the blocking points are just doing a lot of simple and relatively low-tech experiments and studies. And the moment we reach LEV we can easily wait for the rest of the technological progress to catch up. I think you are pretty spot on. But I don't think it will be technological progress that holds us back. Its ALWAYS going to be the regulatory. Of course, I could be wrong and it could be both. With a little luck, it will be a bridge to a bridge to a bridge for a while. I don't like putting a cut-off age on these things because a decade makes a HUGE difference on the millions we put in the ground. The deaths of WWI and WWII are rounding errors compared to aging. I hope we all make it. The parties would be epic. You must consider the doubling not only in prestations/prices (CPU speed/$) but also in the rate new computer are added where they were not used before, making things faster, cheaper, more resilient, resistant and anti-fragile. All field of domotics was changed when Raspberry Pies and tablet were introduced to the market. Everything in a house can be connected in a grid of computers (the Internet of Things). Other innovations (like Bitcoin - BSV not BTC to be clear) pushed ASICs development where it could not be without. The "clearly exponential years" happen when many innovations in unrelated fields collide to improve the speed of improvements in a specific field. I'm especially interested in Bitcoin Satoshi Vision because it restore the original vision, allow online and on chain monetization of everything. And this, in turn, would speed up the rate of improvements of Rejuvenating Therapies and other Life Extension technologies. This is the question of money only. I have lost faith about exponential medicine or exponential rejuvenation therapies. Because of one thing : FDA. There will always be an incompressible 10-15 years between the time a prototype is perfected to the point of being a candidate for a phase 1 clinical trial and the time the product/therapy reach the market. I agree to the fact that it is exponential between laboratory discovery and perfect prototype. But the clinical trials makes things too damn long. I don't see the FDA reforming anything quite soon, if ever. Imagine if a car maker have to test a car for 15 years before reaching the market, the automobile market would advance very slowly. About only 1% of prototypes make it to the market because of that painfully long and expensive clinical trials. The biggest problem of anti-aging is not making therapies, it is FDA. or how do you define "advanced nanotechnology". By definition the nanotechnology we have now is the bleeding edge the most advanced ever. But there are no complex devices that can self-replicate and be controlled remotely to actually repair cells. There are a few delivery devices that could be steered by magnetic fields and probably release a payload. They are called nanobots. They cannot send feedback, are very crude and are basically a glorified nano-particles. Those are important innovations. Now it is easier if not trivial to automate simple lab procedures using off-the shelf computer kits and parts and robot manipulators. Thanks to the wide availability we can connect and share self-experimentation data. Probably some experiments will become cheaper due to easier 3D printing or more efficient suppliers. We will see. @Jonathan Weaver: The editor here is also frustrated by the pace of the FDA process. That is why he suggests medical tourism to more responsive jurisdictions as an alternative to an unacceptable wait. For example, I'll be traveling to Russia this summer to get some Srpycel (Dasatinib) and use it with some quercetin to enhance the autophagy of my monthly 4-day fasts. "You let a lot of these different micro-states bloom, and you can you see what would come out of it, but the specific technological thing that I think could come out of the new political arrangements is always this question whether we can get new medicines or new drugs...Or could you get new medical treatments where you break the FDA monopoly on medicine worldwide?" @Schaefer, yeah! Russia is great place for medical tourism because in Russia like in Japan you must prove only safety of the therapy. There is no private clinic who would administer drugs that are in phase 1 clinical trials, or in experimental stage. This is illegal. The other thing is that it is very expensive to get drugs which we don't know the efficacy or sides effects. It's a lot of effort/money/time for very little rewards. I would suggest the FDA to simply cut off the phase 3 trials. Once we get phase 2 results, we already know the potential sides effects and efficacy of the drug. The drug maker could then make an unnofficial phase 3 to test different dosage and improve the product already on market just after phase 2. I think that AI would help a great deal with developing aging-reversal technologies. @Cuberat: after the recent victory of Deepmind AI against two pro starcraft players, I'm not so sure that Kurzweil is too optimistic. It was not expected to happen so soon. Until a few year ago, while Moore Law dominated, software was the real bottleneck. But now research in deep learning is happening at a super exponential rate and it's hard to predict what we can expect in ten years or so. >I think that AI would help a great deal with developing aging-reversal technologies. That chart hasn't been updated since 2000 (see the black dots). those are valid points. But still don't translate easily into medical research. Deepmind is already trying to translate ML research in the biological field. At the moment they are really distant from clinical applications, but the road is open (https://deepmind.com/blog/alphafold/). For example if this technique learns to design bacteria with desired properties I think that can be very useful for SENS research (it could be a different approach for finding glocosepane breaking bacteria).